By 5am, in a tiny house, in the midst of the Klong Toey slum, Morn, 58 has already been awake for 2 hours. Rising at 3 to boil black beans, which have soaked overnight, she deftly shovels fistfuls of sticky rice into a steamer. By 5.30 she’s out the door and off to market, a ritual she practices daily, in search of the best seasonal fruit, freshly pressed coconut milk as well as tapioca beads, flour and several kilo loads of refined white sugar. By 6.30am she’s back again in her ‘kitchen’ – a small gas burner on a bench top and coal fired pot propped next to the front step outside her house – cooking, mixing, stirring and simmering for the next 5 hours before setting up a street stall at the end of the narrow alleyway near her home. 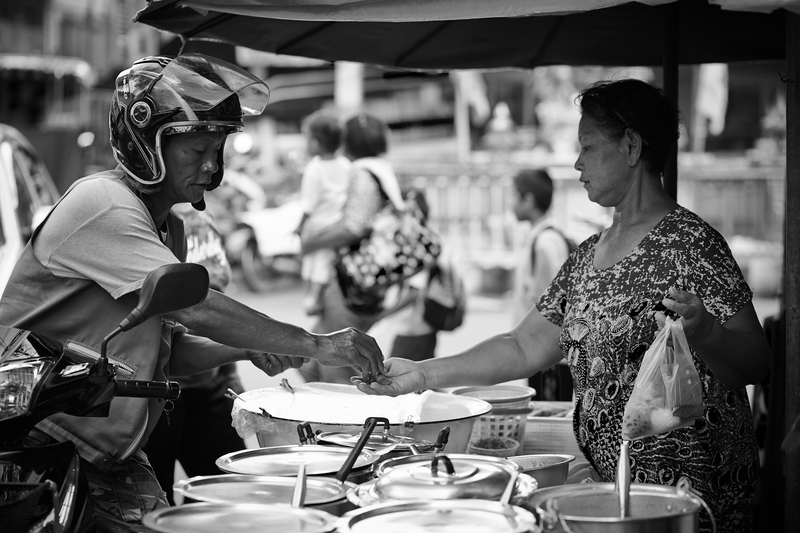 Morn is a 3rd generation Thai dessert maker and street food stall owner and has been practising this daily routine for almost 25 years. Like many Thai’s cooks, there are no recipes as such, nothing written down, and no need for measuring. 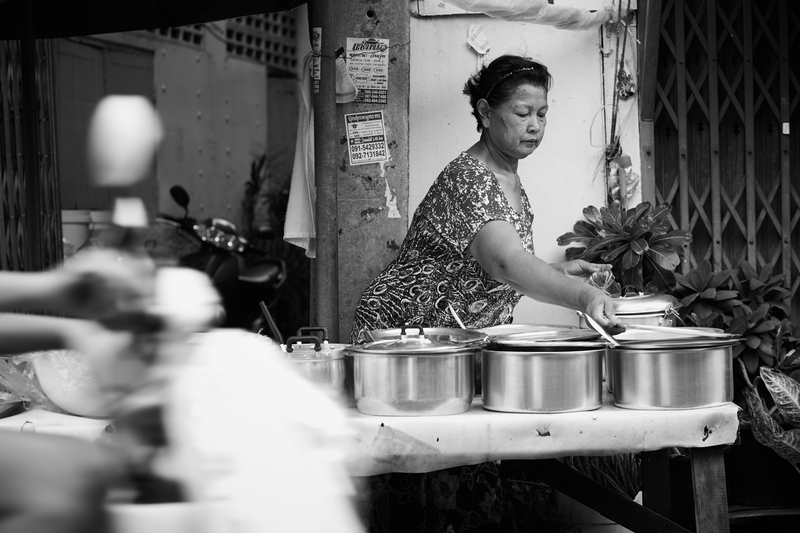 Each dish, of which there are dozens, come from a rich aural history of women – Morn’s mother and her mother before that – teaching and guiding each other in the art (and the business) of kanom (meaning Thai dessert or sweet to taste). “She a much better at it than I ever was,” Ameena, Morn’s 88 year old mother tells me as she sits perched by the window on a plastic stool, watching over the mornings proceedings. 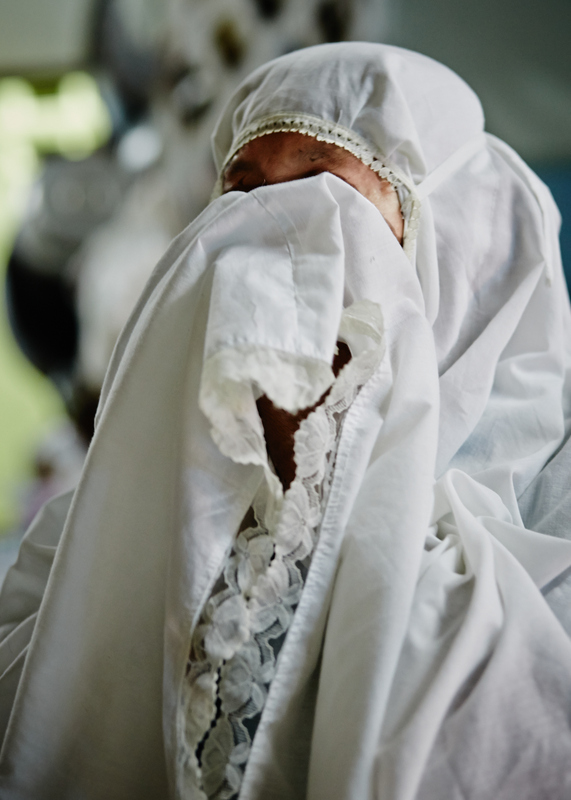 As well as running her business, Morn is also Ameena’s primary carer and mother to her own daughter, Ben, 37. All live here, under the same roof and have done, independently, for many decades. “Every time I have a man in my life it just causes problems, Morn shrugs. “I’ve learnt to do it myself. It’s easier that way. When I’m with a man, it’s not good”. Plonked cross legged on the floor, with tin pots all around, Morn slices the top of a large bag of sugar and pours it in, free form. Though many Thai desserts are based around fresh ingredients and the array of delicious exotic fruits (durian anyone? ), they are also distinctly, exceedingly, hedonistically SWEET. Klong Toey is Bangkok’s largest and most famous ‘slum’, housing some 100,000 residents into just one square kilometre. Deep within it, Morn’s home is humble and typical of so many in this area – a single room downstairs and one up top, little furniture, no tables or chairs, a worn out linoleum covered floor, a big TV, thin chipboard walls and wood panels for windows that open out onto a narrow alleyway that are little more than an arm length from one’s neighbours. At night, mattresses are laid on the floor for sleeping, while by day, they are packed away (except here Ameena’s) to make way for the days cooking, eating and general business. And though this is a community packed with social problems and acute poverty, there are also strong community ties and loving homes, like this one. “It’s not about where you live that’s important it’s about the family and friends that you have. 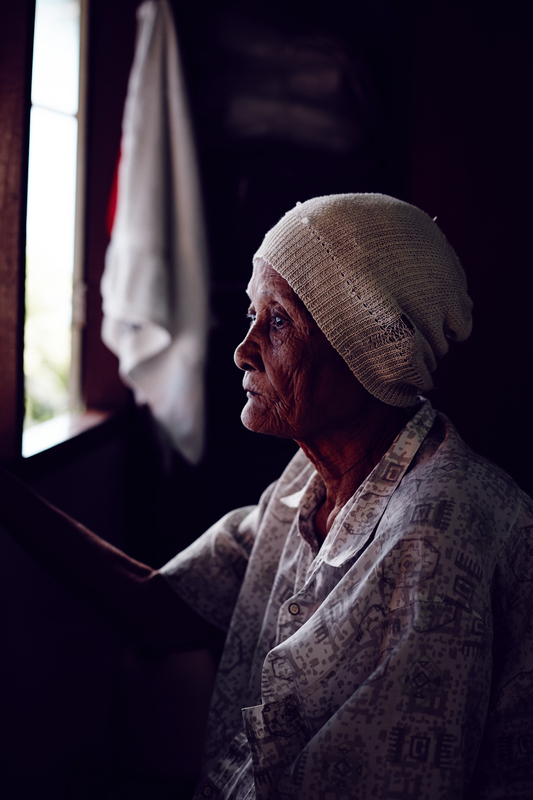 There are many families here who don’t have loved ones close by – maybe their kids are away or in jail or the grandparents are having to take care of their grandkids, there are many stories here of hardship but there is also support. Klong Toey is like a family. We’ve all known each other for years and we’ve been though so many things together. People are always helping each other and looking out for each other. And I also see a lot of young people working hard to raise themselves out of their situation.” Morn tells me. “I wanted to give my daughter a better future, a better chance than what I had. Morn’s daughter Ben is a case in point. University educated with a Bachelors Degree and now working an office job at a Japanese Company she’s also recently bought a house which she’s renovating and paying off her first car. 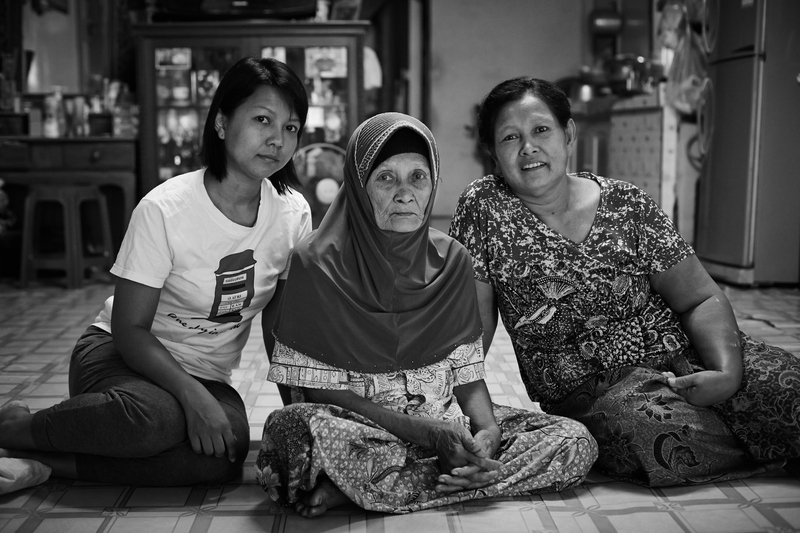 “I wanted to give my daughter a better future, a better chance than what I had. Morn says, proudly pointing to a picture of Ben receiving her degree from the Royal Crown Price of Thailand. “Growing up, our family was very poor and I didn’t have much education. By the age of 10 I was already working in the rice fields and then after that a small garment factory. But once I learnt my mother’s business and then started out on my own, I was able to save. In the end I paid for everything myself – Ben’s schooling and University. It was hard but to see her achieve her goals makes me very happy”. In a family of solo women, driven to get on with the job and to strive despite their circumstances, it’s Ameena who long ago set the bar high and who lead by example. Though now she sleeps soundly, curled up on the floor, her body tiny and her head covered in a worn out woollen beanie, a series of framed photographs adorning the walls of the house tell a distinctly different story. There’s Ameena posing with generals, prime ministers and dignitaries and in one, most notably, at the UN in Geneva with the Queen of Sweden, receiving a Civil Society Award. 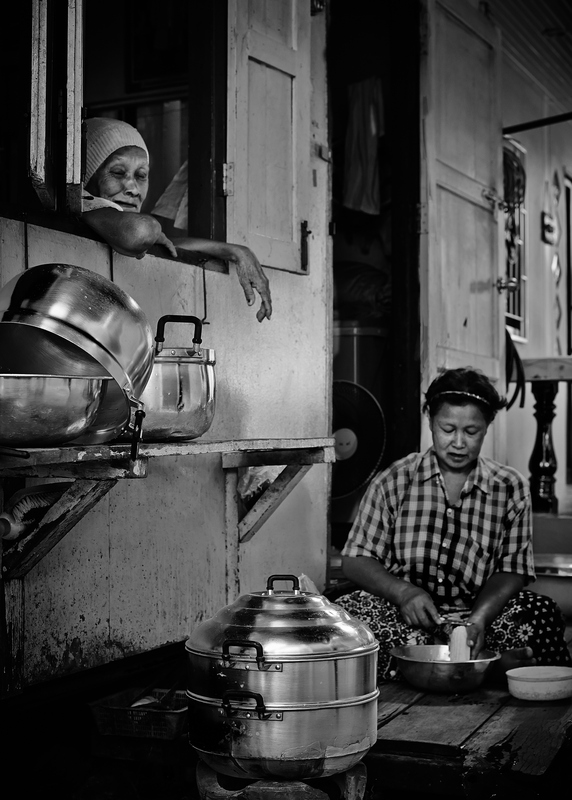 “Everybody in Klong Toey knows about my mother,” Morn says quietly as she gives the tapioca another stir. Though now battling Alzheimer’s, a tumour and the obvious frailty of old age, in her prime Ameena was a once powerful community activist, anti-drugs campaigner and globally recognised trailblazer. Throughout the 80s and 90s, her home, this home, acted as a safe house, a place for weekly meetings and a destination many desperate family members could come to at all times of day and night. In a community addled with addiction and extreme poverty, Ameena, with Morn alongside, provided a beacon of hope, helping hundreds of people to turn their life around and pointing the finger at local dealers when they were able. 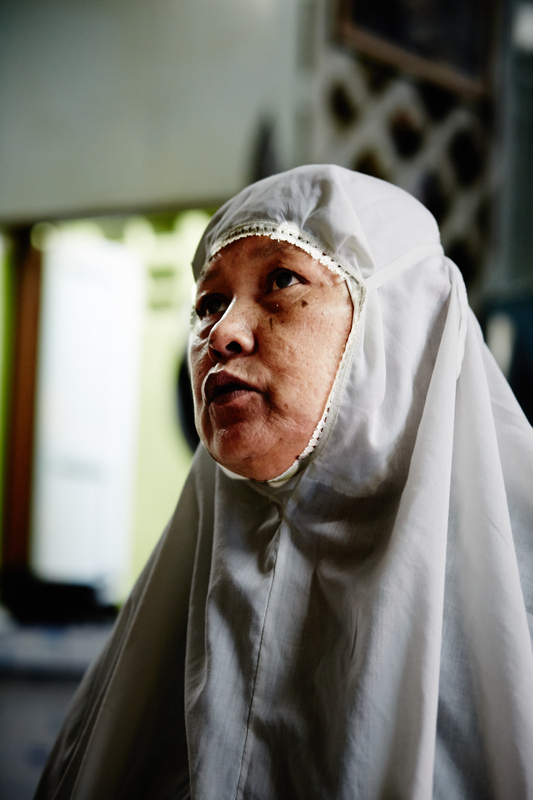 Though there was pressure and often danger in doing so, Ameena insists she was never afraid. “I never worried about them” she says nonchalantly. Having lost a son to addiction Ameena’s passion remained steadfast and determined for many decades. Outside Morn scrubs out pots under a tap and sluices the water away beneath her house. It seems to pool there like a big milky bath but Morn assures me the water will drain away eventually. At 12:16 precisely, a large Islamic Clock blares out an alarm signal. Putting aside her washing, Morn moves inside and to a corner of the room set up for daily prayer. She dons a full length, white hooded cloak and sets out a a small rug in front of a large picture of Mecca. Then, for several minutes she prays and bows quietly for all and sundry passing to see. As committed and practising Muslims, this is a ritual practised several times a day by Morn and Ameena, just as it is the world over. Though very much in the minority and surrounded by Buddhists on all sides, Morn insists that their faith and the practice of it is a complete non-issue. Nobody bats an eyelid and everyone lives peacefully side by side. If only there was such tolerance in the bloody south of the country not to mention so many other parts of the world. By 2pm, when Morn is ready to set up her stall, she carries her pots, one by one, to the end of her alley. A far cry from the delicate crepes and pretty little sweets that ones sees around town, Morn’s fare is decidedly rustic with everything plonked on an old, rickety wooden table. Though her menu changes daily and according to Morn’s mood, today there’s a selection of taro, durian and longan cooked in sweet creamy sauces, a large platter of glistening caramel bananas, a sweet corn and tapioca mix and sticky rice wrapped in fresh pandanus leaves. Unlike the quiet serenity of Morn’s house – out here, at what is a small bustling intersection – it’s a cacophony of noise, movement, colour and chaos. From the countless motorbikes whizzing by, to the fruit carts trundling past, as well as street vendors in all directions dishing out everything from steaming hot soups to spicy som tams. But amongst the hustle and bustle, there is also a distinct village atmosphere – with locals stopping to chat, shopkeepers gossiping, soi dogs circling and somewhat bizarrely, the constant crow of a rooster somewhere close by. Throughout the afternoon Morn’s trade is busy and constant with many regular customers. When I ask about the competition she says she’s never worried too much about it and in fact, notes, few have the stamina. “I’ve been asked for my recipes many times’, she says, “and I always give them to whoever asks. They might set up a stall but they only last a few days or a week. Not many people have what it takes to do what I do so I never worry. As long as I have enough to get by and to take care of my mother and my daughter I am okay. Sabai sabai … “ she says smiling. Yet, behind this relaxed and seemingly casual exterior lies a woman, and indeed a family of women, with steely determination and immense inner strength. Though she underplays it, Morn carries a huge load, working the hours she does week in, week out, as well single- handedly managing the growing health concerns of her mother. When I ask Morn if she plans to retire, she laughs, saying it won’t be anytime soon. Though her body is getting tired with the long hours, and her knees are giving her trouble, she sees it as her responsibility and her duty to work the way she does, and without fanfare. “I will continue to work just as hard as I always have until I cannot move! My mother is old and my daughter is still getting established in life so it’s my responsibility to take care of them both and to take care of the home. But really I don’t mind. I am the head of the family after all”.